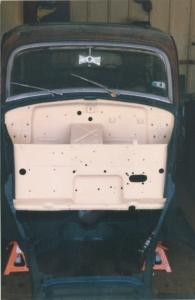 I actually started the current restoration project so I could easily move the car to make room for working on other stuff. 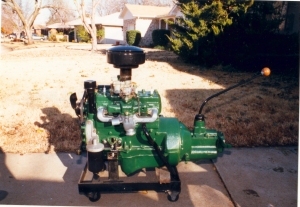 I was just going to get its engine running and the brakes working so it could be moved under its own power. Well, that was the original plan. I had started the engine just last year so that was not too hard. When it came to life this time, it sounded so good I decided to let it run a while. But first, I had to replace the water outlet and connect the radiator and water pump. My first real shock came when I removed the hose from the old, badly corroded water outlet; the outlet was full of some green solid stuff. Expecting the worst, I removed the outlet and it looked like the water jacket was full of antifreeze jelly - bad but better than the solidified stuff. Lesson number 1: NEVER let old coolant remain in a neglected system. After finally cleaning this out and getting it all hooked back up, I got it started and let it run about 30 minutes, only to discover that the rear, side core (freeze) plug was a little rusted and had a slight leak at the bottom. It looked like this would be easier to repair with the engine out of the car, so I pulled it and removed all the plugs. The reason for the rusted one was immediately obvious -- the water jacket was sludged up to the bottom of the plug with over an inch of muck. Armed with this information, I removed all the plugs, made a tool and spent about half a day, probing through every available access point, thoroughly cleaning and flushing the system. Then I located some new core plugs and installed them. In searching for parts, I found a couple of NOS British head gaskets and a new fuel pump. With all this done, it only seemed reasonable to go ahead with a hand valve lapping to remove surface rust and ensure proper sealing. After all, the engine was already on the bench. It only had a few miles on a complete overhaul of several years previous so this work seemed worthwhile. Then, of course, I had to paint it before reinstalling. By this time, I began to think about the All British car show next spring and the fact that this car will be 50 years old then. Now it seemed only fitting to at least get it running and presentable to enter the show. I had never seen another Ford in the show. 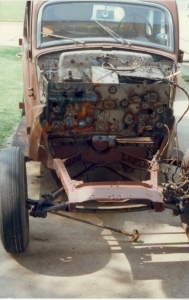 Besides, it seemed a shame to have the engine out and not repair the transmission and firewall. So, I repaired the transmission so it should now stay in 2nd gear and painted the gearbox also. The color is quite close to the original but is a standard catalyzed industrial enamel. These two photos are of the engine and gearbox waiting, on my homebuilt dolly, for re-installation. Be honest with yourself now. Isn't that just about the cutest little motor you ever saw? Well, since we were going to the car show, I thought to be show worthy, even as a "Restoration-In-Progress", at least part of it should be finished to give some indication as to the final result. Since the engine and gearbox were already out, the engine bay or everything under the bonnet became "that part". So I set about to remove the wings and everything else I could to gain access to the bulkhead and chassis for a proper job. I knew there would not be time for much more than this so the body would just be cleaned of the spray can and other loose paint, down to a solid base, then coated with epoxy primer until after the show. 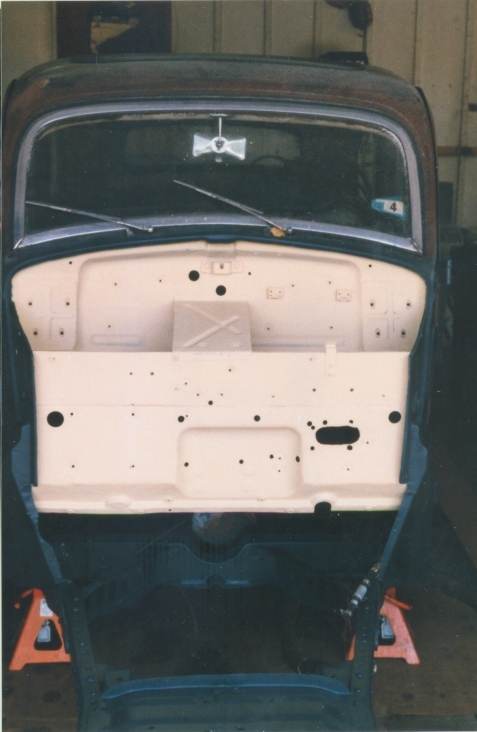 These two photos are of the bulkhead (firewall), but after the holes had been filled and some straightening had been accomplished. The first pass patched some 42 holes; I later made a second pass to get a few more but didn't count them this time - you know, only so many fingers and all. 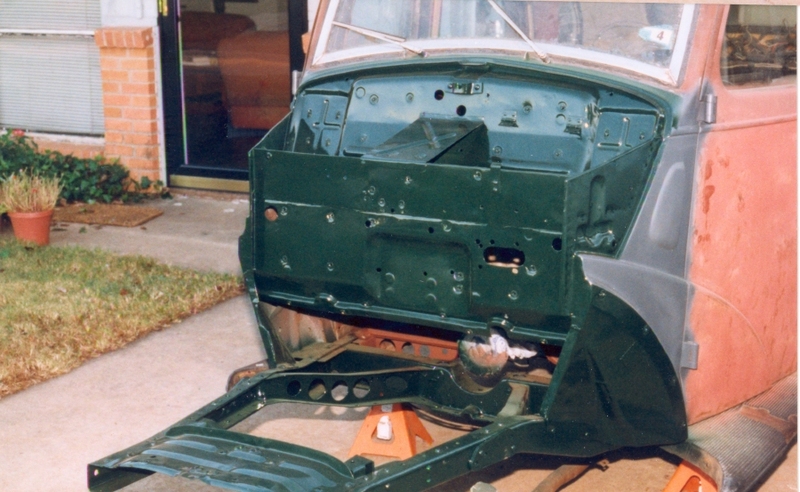 Note that the frame has been sand blasted and then primed with a rust inhibiting primer. Also, the axle and suspension has been removed and is just sitting under the frame so I can easily move it but clean up work has not yet begun on it in this photo. After filling all unnecessary holes and repairing some very minor rust under the right wing (fender), I prepped and painted the whole area, back to the frame crossmember under the front seat with PPG epoxy primer. I then followed with K200 urethane primer/surfacer on the firewall for block sanding. This photo is of the firewall after the block sanding. Notice that there are still several holes. At first, I was a little worried about this but I now think they all have a purpose, most of which have already been identified. The frame here shows the epoxy primer. It didn't get the urethane primer or block sanding. 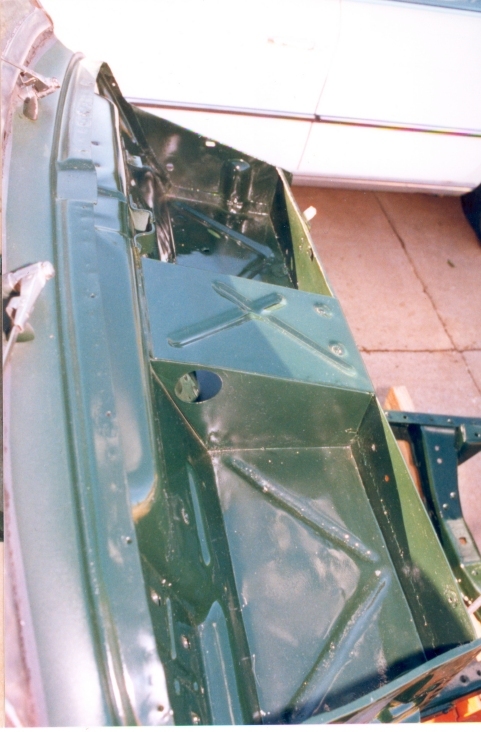 The next step was to seal the urethane primer with another coat of epoxy and apply several coats of PPG Deltron urethane topcoat in a mid 70's Jaguar version of BRG (British Racing Green). I wish the screen could even begin to show the real beauty of this paint. It is really great stuff. I have also completely converted over to HVLP spraying. It not only saves a great deal of expensive materials but it also saves nearly all the mess on the floor. All the painting so far has been done in my garage, with a drop cloth under the car, and the stuff just sweeps up with a broom much like lacquer. It flashes "tack free" so fast that the very few dust, bug or other blemishes are easily removed by the eventual color sanding that the car will receive. This is the bulkhead and frame after final painting, ready for the engine and sheet metal to be reinstalled. You can see here that the floor has been removed. 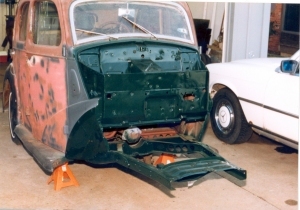 You also see a cross member, through the missing floor, which is in the rust inhibiting primer and the interior has not yet been painted. Both these have since been finished. Actually, the floor (front section) was in three pieces. 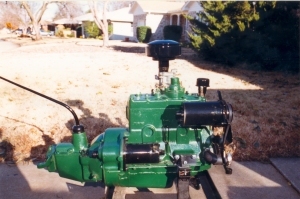 The center is easily removable for access to the gearbox, while the side pieces are more permanently installed with tar. All these have also been painted then undercoated and painted again also in BRG. Finally, they were reinstalled, but using modern seam sealer instead of tar this time. This photo shows a section I am particularly proud of. It is a shelf at the top of the firewall. The compartment closest is the battery box. 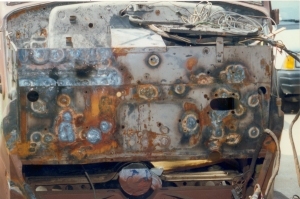 It was completely rusted out and had been patched for years with fiberglass, which I removed. I then fabricated a new battery tray, including the formed stiffening and a bracket beneath, out of view, and welded it in place as shown here. The far side is, I believe, a tool compartment. Its floor had been badly cut up and rolled out of the way for something. (Ok, I have to confess. It was cut and rolled back to make room for that very much oversized Dodge pedal assembly way back in my first attempt at hydraulic brakes. A long time ago, when I removed it and installed the Prefect hydraulics, I rolled it roughly back into place and fiberglassed it, not an entirely satisfactory solution but it worked at the time. To do it right this time, I chipped away all the fiberglass and carefully pounded it back into shape with my wife's help, carefully welding it as we progressed. Finally, a little filler was required. The result is what you see here. 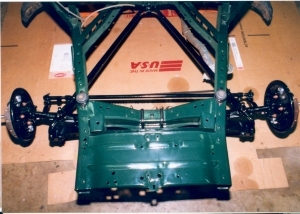 The next picture shows the frame and front axle. 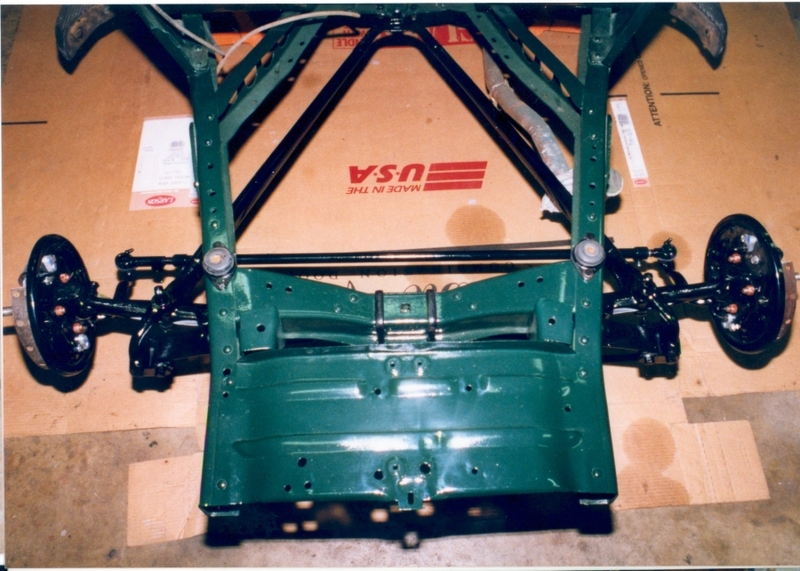 The axle was carefully stripped and prepped as much as possible. It then received a light coat of the rust inhibitor just to protect the spots where metal prep was difficult to apply and work. It then got 2 coats of the epoxy primer followed by 2 coats of the urethane catalyzed industrial enamel. The whole thing was then reinstalled as shown here. With wheels remounted, the car was once again easily moved by hand. See Chapter II - The All British Car Show"